← How Big is Your Don't Like List? My mother had a green thumb. Which is like saying Bill Gates has money. I used to joke that she could put a table leg in a bucket of water and it would sprout. For many years she ran a sort of plant hospital in her dining room window. People would bring her pots with what looked like dead sticks poked into dirt. “Can you help?” they’d ask softly. Mum would put the plant in the window, sighing and shaking her head at the state of it. Over the next little while, she would prune away the dead bits, repot what was left. Water and turn it towards the light and say encouraging words. Before long, there would be new shoots. Leaves, flowers, flourishing life. The plants would go back home to their families. Some made return visits. Some just stayed in the window. I don’t recall a single one ever failing. That’s how good Mum was. I didn’t think I’d inherited her abilities. In the first years of my marriage, I’d forget to water my plants. Or I’d water them regularly but not give them enough light or love or something. They limped along, with regular care from my mother. Eventually, I just gave up. 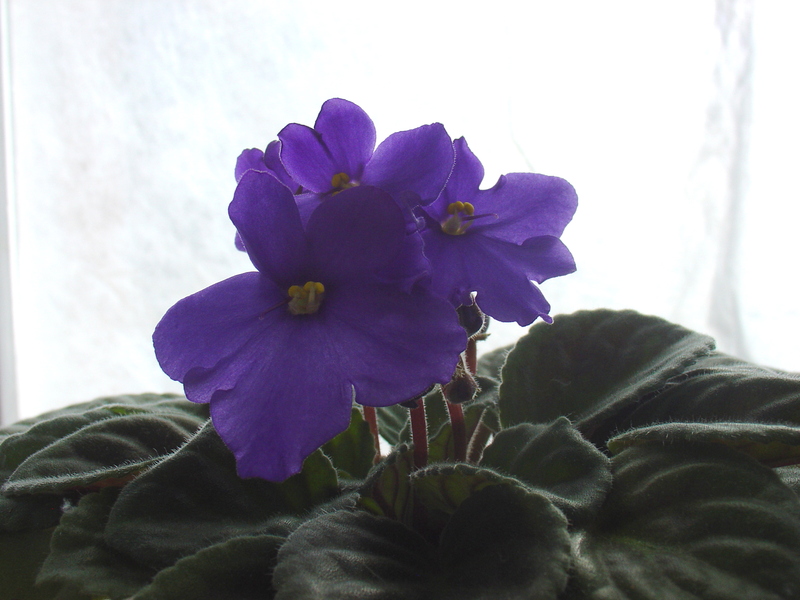 We were plantless for quite awhile until my past birthday, when a friend gave me an African violet in full bloom. Such a beautiful little plant, I was nervous to take it home with my mother no longer here to bail me out. But I set it in a sunny window. Watered it carefully (they don’t like getting their leaves wet) and spoke encouraging words every time I did. When the blossoms were spent, I pulled them off, wondering if I’d ever see more. Last week I noticed a bud. And then more. And now flowers. An abundance of them. They make me smile every time I look at them and I congratulate the little plant for putting on such a grand show. And I think of my mother and her dining room window. Have any of you noticed yourselves turning into the people you love in ways you didn’t expect? Truly lovely, both the photo and the story. If someone told me I was turning into my mother, I’d flinch. Nice to hear you’ve had a different experience. I’m going to carry the positive side of your question around for a while. If anything interesting (and shareable) comes up, I’ll report back. I chose the title purposely because so many of us do flinch at turning into our parents. And yet, they were such complex people, with characteristics I want for myself and some I’d like to leave behind. Deciding which is which can be a lifelong task. If only I could turn into my mother! She took such care to see that I would have opportunities she didn’t – and that care formed me in ways she didn’t have the chance to grow. She made great choices for me, but my heart will never be as big as hers was.. The fact that you know and appreciate the sacrifices she made tells me that your heart is far bigger than you know.